Unique couple of giltwood busts. Italy, circa 1780. Beautiful weathered, small losses and old repairs. More photo's available on request. 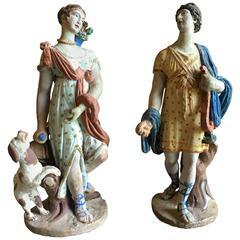 Nice couple of two gilded classical fragments with a beautiful weathered look, Italy, circa 1780. Weathered. Measurement here below is inclusive the wooden base. 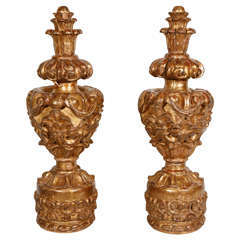 Beautiful Baroque carved wooden fragments with great patina. Italy, circa 1750. Weathered measurement here below is of one curl inclusive the wooden base. 18th century carved giltwood fragments. 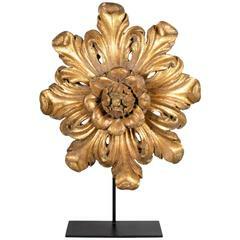 Dramatic carved giltwood floral form architectural element, 18th century. Mounted for display on custom mount. Dimensions: 20 × 17 inches (not including stand). 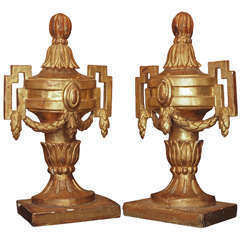 Pair of very finely carved 18th century Italian giltwood saints. The metal candleholder is not original.